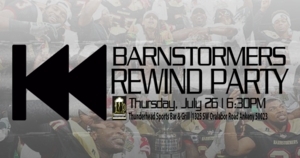 DES MOINES - The Iowa Barnstormers will host a Championship Rewind Party on Thursday, July 26 at Thunderhead Sports Bar and Grill. Fans will have the chance to join members of the Iowa Barnstormers front office and coaching staff to re-watch the team's United Bowl victory over the Sioux Falls Storm starting at 6:30 p.m. The Championship Rewind Party will benefit the Larry Cotlar Foundation. A $5 cover charge for each guest will grant them entry to the event and a raffle ticket to enter to win prizes including a United Bowl Football, Thunderhead gift cards, and more. Additional raffle tickets will be available for $5 each. All of the proceeds will benefit the Cotlar family. The Iowa Barnstormers will have Championship t-shirts and hats available for sale as well as Larry Cotlar's book, The Biggest Rolodex in Sports. Thunderhead Sports Bar and Grill is located at 1325 SW Oralabor Road in Ankeny. Help the Iowa Barnstormers keep the Championship vibe alive! Season Tickets for the 2019 season are on sale now for as low as $120 per seat. Order before August 31 and you'll receive a special discount! For more information, contact the Iowa Barnstormers front office at 515-633-2255.